Personalized Rookie of the Year Baseball theme Thank You with photo. Double sided. FILE DOWNLOAD only printable. 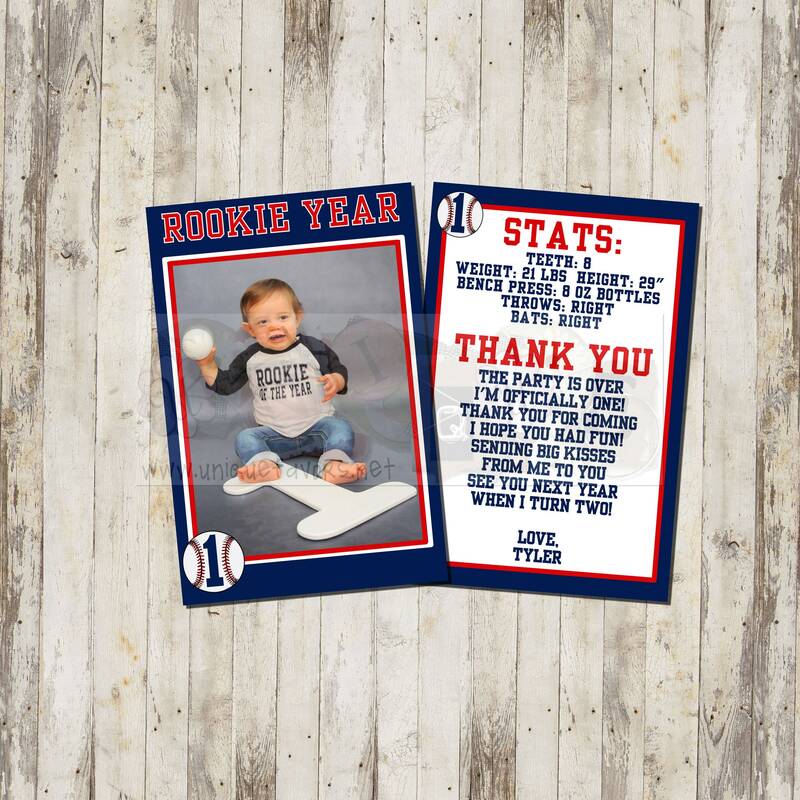 This listing is for a personalized Rookie of the Year Baseball Thank You as shown. You provide the information to customize this design. The listing is for this design only and can be done for a boy or girl. Any age! This design also includes a photo. You will receive a high resolution jpeg file to print from. If you also need custom printing, please message me or check my other listings for options. This listing is ONLY for the downloadable file. If you want a finished printed item, please check my other listings or request a custom. Please note this listing is for this design, wording and colors only! 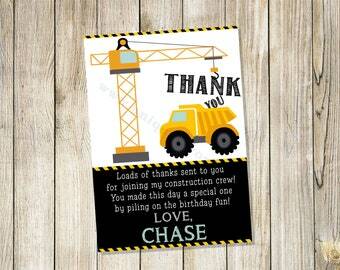 If you want to change the Thank You, please request a custom order. 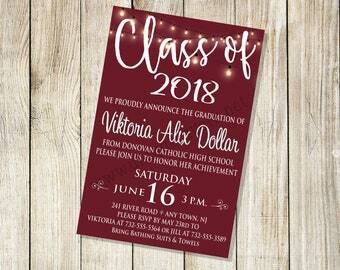 Provide the personalization for the top of the invite and the name at check out. Colors are as shown. If you don't see the colors you want in my store, please request a custom design! 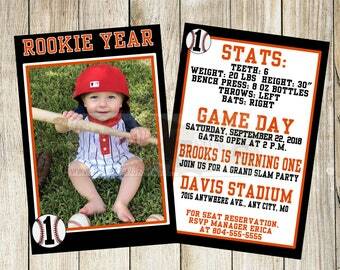 Invitations available in my store! All designs shown are my own creation and I retain all copyrights. Any items used with permission for my use within these files remain copyrighted by the original owner. Some personal use items shown in samples can not be duplicated for use by others. So if you like a design you see it may or may not be able to be used again for other clients. I'd love to design something new for you! Custom designs are available! 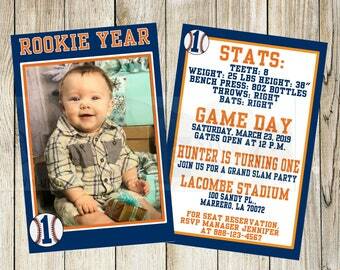 Give me your ideas and I can create a beautiful invitation or announcement for you. Birthday, Anniversary and Holiday designs are also available. Corporate Holiday cards are also available. For other custom designs, please request a custom order! **Designs are available with custom full color digital press printing on high quality card stock in my store! 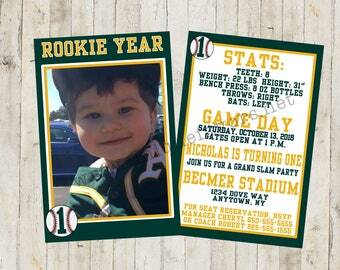 Personalized Rookie of the Year Baseball theme invitation with photo. Double sided, 2 sizes available. FILE DOWNLOAD only printable. 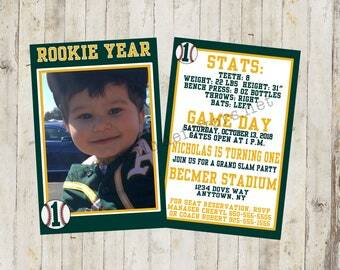 Personalized Rookie of the Year Baseball theme invitation with photo. Green & Yellow. 2-sided, 2 sizes available. FILE DOWNLOAD You Print! 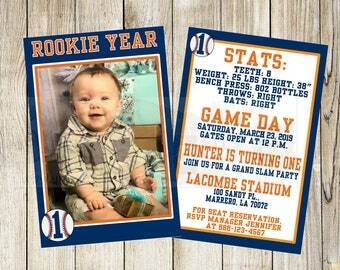 Personalized Rookie of the Year Baseball invitation with photo. Orange Blue Astro Colors. 2-sided, 2 size options. FILE DOWNLOAD You Print! 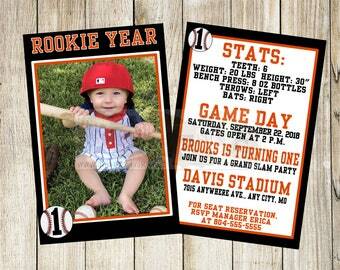 Personalized Rookie of the Year Baseball invitation with photo. Orange Black Colors. 2-sided, 2 size options. FILE DOWNLOAD You Print! 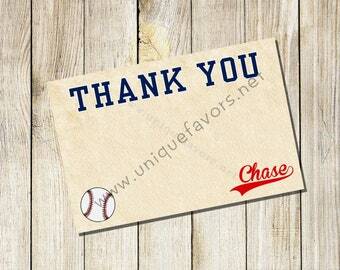 Baseball theme Thank You card Personalized. DIGITAL FILE ONLY. You print!